Remodelling a bathroom? 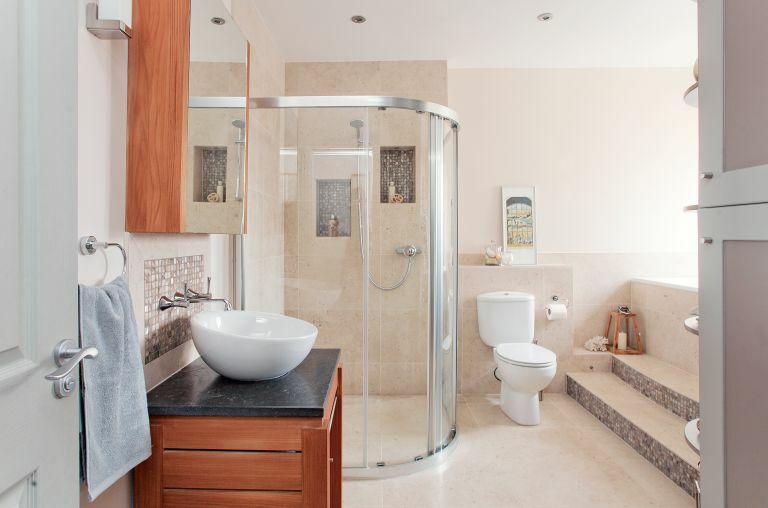 Be inspired by this modernised bathroom in a semi-detached family home. If you like this, take a look at one of our other real home transformations. ‘We loved the high ceilings and light, spacious rooms when we first viewed the house, back in 2011,’ recalls Catherine. ‘It has the style of an Edwardian property, but was built in 2006, so it has all the benefits of a modern home, such as good heating and insulation. ‘While the developer built the house to a very high standard, we believe that the fittings were chosen with the rental market in mind: quickly and cheaply,’ she adds. When the showers in the family’s two bathrooms both started leaking at around the same time, Catherine and John decided that their planned kitchen refurbishment could wait a little while longer. Instead, it was time to get straight to work on the bathrooms, revamping them both in one go. Not only was the basin in top condition, but the WC and shower fittings were all as good as new, too, and the couple decided to reuse them in their new scheme. ‘I believe in recycling and reusing products where possible,’ says Catherine. ‘There was nothing wrong with the bath, but it wouldn’t fit into the new layout, and I was keen to avoid sending it to landfill, so passed it on to a local recycling scheme.